I just can't stop! 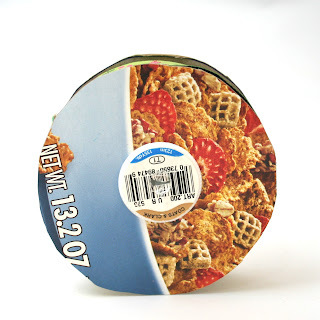 I made this ribbon spool from an empty thread spool and a cereal box. 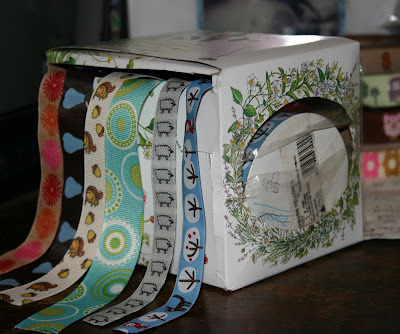 In an effort to be more environmentally friendly and reduce my "carbon footprint" I am reusing kleenex boxes as ribbon organizers. This way I am more organized and clutter free, while at the same time reducing the amount of trash I create. Also, it is FREE and who doesn't like that. 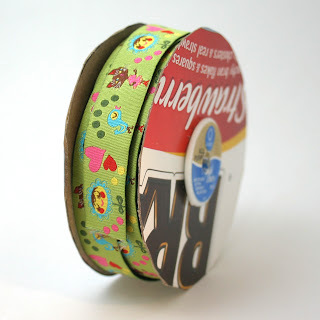 All I did was push the spools of ribbon through the tissue opening and cut a slit for the ribbon to hang out. I feel very crafty and creative right now. Yay me! Twitter: to utter a succession of small, tremulous sounds, as a bird. 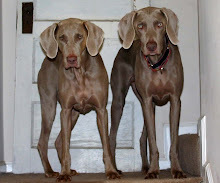 Welcome to the new blog for The Mod Dog. 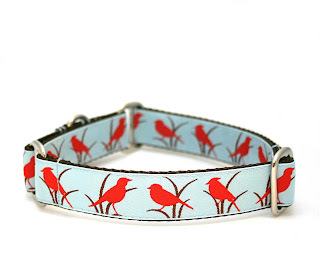 Here I will post info on new collar designs, upcoming shows, and answer any questions about my shop. Please feel free to e-mail me at kyra@themoddog.com if you have any questions regarding any of the collars in my shop, placing a custom order, or just general questions about collars.